People-oriented, customer first. Brand establishment, Chirag jump to construct the specialization of auspicious name management team and active sales team, Introduction of outstanding professionals. Standardize enterprise management, strengthen the comprehensive management, city development, procurement processing, team progress "four platform construction. 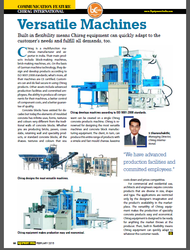 Nowadays, the general manager of the management team is brought down: for development, build the century enterprise", promote enterprise development rapidly.As a forerunner Chirag machinery, we shoulder a hard and solemn mission. We are of the leading technology and internationally good quality. "Adopting the group coordination, gaining the innovative achievements" are always our pursuits and dreams, After the year's trials and hardships, we have now laid a solid foundation. We will use the persistent confidence and will to regard every fruit and appreciation as a new starting point. We constantly forge ahead, challenge and surpass ourselves, keep climbing to the new peaks, we join you on the basis of fine sincerity and double-win for purpose of advancing towards the next objective. New Multifunction Machine now in India. 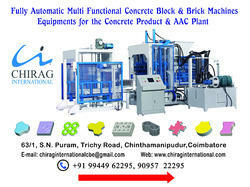 Concrete Block,B rick and Paver in Single machine now in India (this machine is multifunctional, could make all kinds of Blocks, Bricks and Pavers while change the moulds.